I love this piece. When I play it I think of “Star Wars.” My favorite part of this piece is….the end…not only do you get the satisfaction of being done but you finish with a bang! This piece of music invokes the imagination and tells the story of a super hero. This piece is very special because it was the piece I performed with the Atlanta Symphony. 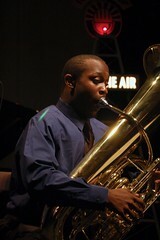 This was also the very first concerto I performed on the tuba. The most important thing to get across is a story of a hero. The hardest things to nail are the technical licks. This piece does not compare to any piece I’ve performed. Although I know I will be playing and performing a lot more works this particular piece will always stay with me because I just have a blast while playing it. Post Show Reflection: Playing in the Majestic Theater was such a big honor. Not only did I get to be a part of American history, I got to play along side with Christopher O’Riley, which is an honor in itself. I envision Carmen’s personality when I play this. She is very headstrong, quite mischievous and has a volatile mood…I also try to keep the color red in my mind while I play this – not just the bright red we commonly see, but different shades of red including a darker, sultrier red, and a playful, lighter red. If I could pick out a specific reason why I love [this piece], I would say because it makes me feel dangerous. I think the most special thing about this piece is the fact that it’s adapted from an opera. It gives the performer and listener a story to visualize while the notes fly by, and it’s interesting how perfectly the music intertwines with the plot. I think technically, I can definitely say this has been one of the most challenging pieces I have ever played. Especially when entering the last movement, the speed at which your hand has to move throughout the piece can become nerve wracking. Post Show Reflection: It was amazing performing this on From The Top. I’ve never had so much fun performing Carmen, and for 5 minutes, I actually felt like I was Carmen. I just want to say that everything seems more intimidating than it actually is, and everyone including all the staff makes it the most memorable experience. When I was on that stage, I rediscovered how much I love music and love performing and that while ultimately, it’s possible I may take a different path in life, I will always play and cherish music. I really like the energy, the excitement, and the colors this piece has (very orange). When I play it, I think about this paper monster named Oogles, who I hang in staircases at the Pennsylvania Academy of Music to try and scare people (it doesn’t always work). My favorite part about this piece is the doodly harmonic thingies, and my least favorite part is the end, because then it’s over! The most important thing to nail in this piece is probably those octaves, because if one gets out of tune, the rest sound bad. Compared to other pieces I’ve performed, it has some exquisite “woohoo” stuff to it. Post Show Reflection: Playing on stage for From the Top was a thrilling experience. I was so excited when I walked on stage. It was great to see such a huge, excited audience! The entire experience was one of the best performance opportunities of my life. It was an absolute honor! This piece, La Campanella, by Franz Liszt means “The Little Bell.” My favorite part in the piece is all the large leaps and jumps that occur repeatedly throughout the piece. The music invokes images of bells ringing in the air, which is that high D# that the right hand plays. Although the piece is difficult, it is an enjoyable piece to play. The original theme is how the piece starts off, and it gets more and more elaborated as variations as the theme reoccurs. The most important thing to get across in the piece is to get the high D#’s (bells) ringing whenever the theme reappears and to keep the bell essence. The hardest thing in the piece is to get all the repeating notes to sound and also to keep a consistent tempo for the majority of the piece. Compared to other pieces, La Campanella is made of a simple melody that gets turned into something much more difficult. Post Show Reflection: To perform this piece for the radio show, it really was a wonderful experience. 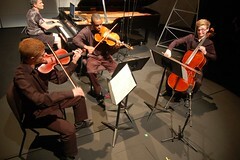 It did feel different from other performances – It was more fun and enjoyable to play. I didn’t feel nervous at all – the interview and performance was really comfortable…it really was a great three days. You learn so much more from that short amount of time and everything was an awarding experience. I love this because it is very catchy and dance like, but also has a very beautiful melody midway through the piece. The ending is especially awesome and energetic and you can never get tired of playing it. I learned a lot working with Christopher O’Riley on this piece. He was a very good coach for our group and gave a lot of great pointers. He also took the ending the fastest I’ve ever heard it which was also pretty exciting. This piece is constant excitement all the way through. It’s like a high-energy gypsy dance. My favorite part is the really fast ending. It’s difficult to play the piece loudly and with a lot of excitement without being very rough and sloppy. This is what I try most to avoid, so I must hold myself back from getting completely carried away by the music. The piece is incredible. The ending is my favorite part and the most fun to play just because it gets so epic and out of control. It essentially ends in a total state of chaos, and yet it’s incredible. The first rehearsal we had with Chris O’Riley on this, I remember not expecting to play the ending like we did. It was so fast and awesome. Great fun playing it! What is special about this piece is the almost gypsy like nature of it, but still in a Brahms like manner. The hardest part is the lyrical middle section between the cello and violin. It’s so exposed and hard to make beautiful.